The most obvious things we can gather about K% from this is that if you strike out a lot, you will probably have a lower batting average (and therefore, indirectly, a lower OBP), but that you will also tend to hit for more power. Being a power hitter may also cause you to get pitched around, leading to a higher BB%. The power and the contact basically offset each other overall, though. But let’s think about causality. Does it make sense that striking out more would directly cause a drop in batting average? Definitely. Does it make sense that striking out more would directly cause a rise in ISO (which is SLG – AVG)? Not at all, really. If you put me in the majors, I’d K at least 95% of the time, but I definitely wouldn’t have a high ISO to show for it. How about reversing the causality — does trying to hit for more power make you K more? OK, maybe a bit. But I think there’s a more important factor at work: selection bias. Would they even be in the majors if they had a typical (about 0.145) ISO? Some definitely wouldn’t, and the others would be borderline players. If you could get a random, representative sample of the entire world population, I believe it would become pretty apparent that strikeouts do in fact matter to batters. As it is, however, the fact that pretty much all the high-K% batters are only selected to play in the majors if they have phenomenal power to make up for it has created bias in the sample. Another analogy: let’s say successful actresses are either very beautiful (e.g. Megan Fox) or very talented (e.g. Maggie Smith). Occasionally, an actress will be both (e.g. Charlize Theron). The selections of the casting people will pretty much keep actresses who are neither beautiful nor talented out of the big movies and shows. You might find a little bit of an imbalance towards beautiful actresses with not much talent; this could cause the overall sample to show no correlation between talent and success, when you’re only looking at those who’ve made it to the big time. But, as shown by all the actresses who never made it because they weren’t talented enough to overcome their lack of beauty, talent really does matter. Edwin Encarnacion, meanwhile, is looking like a talented, beautiful actress who just hasn’t been getting great roles lately (as shown by his BABIP). I think there are around four basic abilities that contribute to a player’s offense: Contact ability, Eye/ Plate Discipline, Power, and Speed. A fifth consideration is of course luck, or randomness. They are all difficult to quantify, but there’s an interplay between them that contributes towards the more easily-quantified stats like AVG, OBP, SLG, and wOBA. Below is a table of those traits with what I believe to be the best proxies for those traits, listed in order. The asterisk next to HR/FB is there because I feel like park influences taint the stat quite a bit as a measure of true power; a park-adjusted version of the stat would be ideal. K% is not entirely direct for either Contact or Eye; some Ks are due to whiffing, while others are due to misjudging a pitch and taking it for a strike. It would be nice to see a distinction between the two types of Ks, I think. The batted ball stats LD% (Line Drives) and PU (Pop-Ups, which is FB%*IFFB%) are there because the trajectory of the contact matters too, not just whether contact was made or not. I don’t think there really is a great proxy for speed, though. BIS is now timing players on base running events, and I think that has the potential to create some very good results. But we’ll be looking at wOBA here, which doesn’t really factor speed in much, other than the impact it has when a player legs out an infield hit, or pulls off an extra base on his hit. Since my sample goes way back to 1913, whereas some of the best above stats are only available from 2002 onwards, I’ve chosen, for the study you’re about to see, K%, BB%, ISO, and BABIP as the key factors to examine. 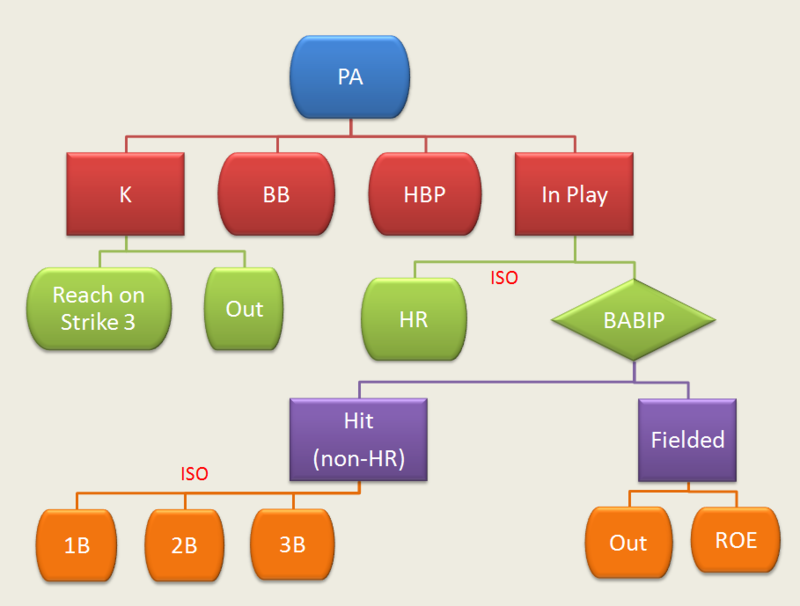 With these factors (sometimes using HR/PA instead of ISO), you can pretty closely approximate AVG, OBP, SLG, and wOBA. These are, of course, the basic ways a plate appearance can turn out. We have BB% and K% reflecting the chance of a walk or strikeout, and we have the semi-random, infrequent events like hit by pitch or reaching on error. The leftover is the balls hit in play. Since home runs aren’t (generally) subject to being caught, BABIP leaves them out of the equation, and only considers balls that are caught/putouts or those that become singles, doubles, or triples. A player’s power, reflected by ISO, plays a big part in deciding whether a batted ball will go for a home run or otherwise make it past the outfielders. Meanwhile, BABIP is part luck, part a reflection of a player’s contact, power, and speed. And you can’t neglect the role luck plays in everything. If Trout had not improved his K% in 2013, his OBP would have been about 13 points lower than it is, and his wOBA approximately 11 points lower. He’d still be amazing; just less so. Ted Williams, by the way: career 0.289 ISO and 7.2% K%. Amazing. It can be done. He thinks there is a genetic component to the ability to discern balls and strikes — some are “born with it” — but he’s working to get the most out of what he has. I agree with that, although perhaps a lot of it is developmental from an early age, and not necessarily genetic. I think that helps explain why a player who can truly do it all is pretty rare. Cabrera has elite power, contact, and plate discipline, but is not even close in speed. This year, Chris Davis is showing the power and eye, but definitely not contact. Mike Trout is a bit short of elite in the contact department, but definitely has it in the other areas. Andrew McCutchen might have a bit of a case, although some of his traits are just borderline elite. So, there are different ways to reach the same level of productivity, and by nature, people are unlikely to be outstanding in all of them. Talent evaluators in baseball will give a chance to a power hitter who strikes out a lot, because he’s capable of reaching an equivalent level of production as a player who strikes out less but hits for less power. They’re just making the most of what’s available. A truly perfect hitter, however, would never strike out. Each time they strike out is one less time a ball they could have otherwise hit might fall in for a hit, or that they might have drawn a walk. Obvious, right? All else equal, strikeouts are bad. I guess the real question is, if you told a guy like Chris Carter to try to strike out less, how might that affect his overall performance? Is changing his approach more likely to be helpful or detrimental? Let me hear your thoughts. We hoped you liked reading Why Strikeouts Secretly Matter for Batters by Steve Staude! If you asked me that question about Carter, I’d ask followup questions… how many guys like Carter have ever been able to strike out less? And what happened to them? My guess would be very few players like him were able to decrease their strikeouts, and those that could/did… ended up out of the game within two years. Because I think the dropoff in power/iso would outweigh the gain in contact… and additionally, I don’t think their OBP would go up much, as they’d begin to walk less (less power=less walks). But thats just a wild guess. Thanks! Good idea. I’ll see what I can do.